The Bombardier CRJ900 regional jet. 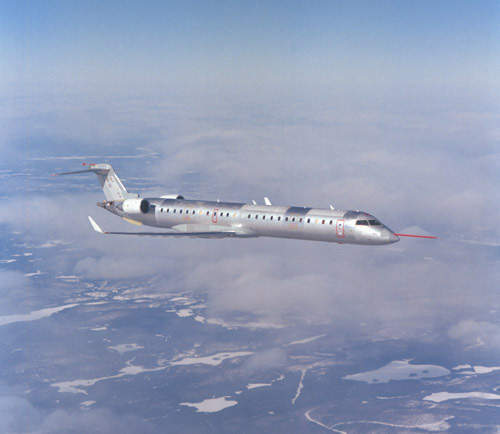 The CRJ900 completed its first flight on 21 February 2001 at Mirabel International Airport. The 86-seat CRJ900 is a stretched variant of the 70-seat CRJ700. 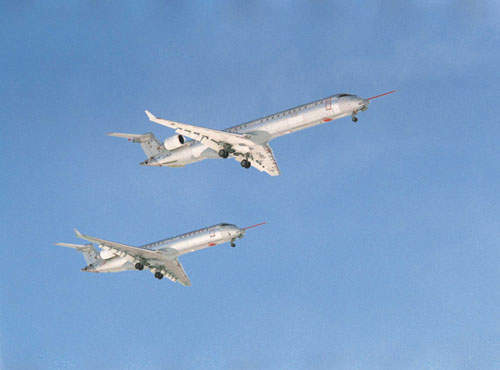 The CRJ900 flying above the CRJ700. CRJ900 coming in to land. The CRJ900 has a range of 2,774km, while the extended-range CRJ900ER has a range of up to 3,207km. 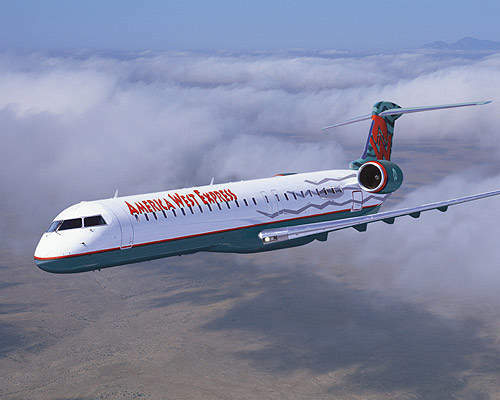 CRJ900 in the colours of America West Express Airlines. The CRJ900 is powered by two General Electric CF34-8C5 turbofan engines. 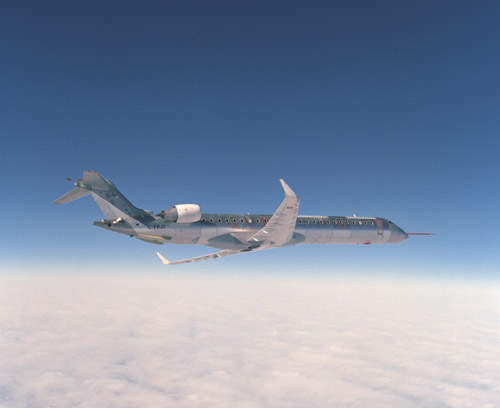 CRJ900 under construction – wingmating. 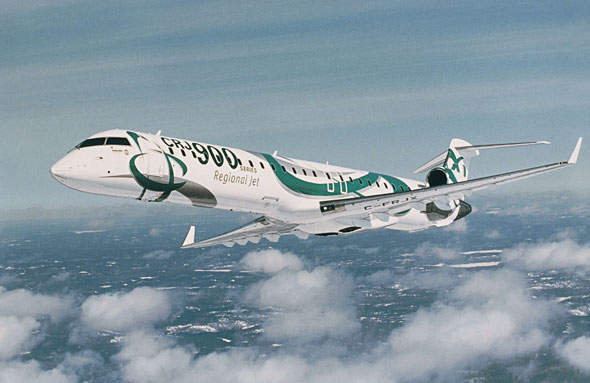 The CRJ900 is the latest member of Bombadier Aerospace Canadair regional jet family. Bombardier CRJ900 regional jet, a stretched derivative of the CRJ700 was announced in 1999. 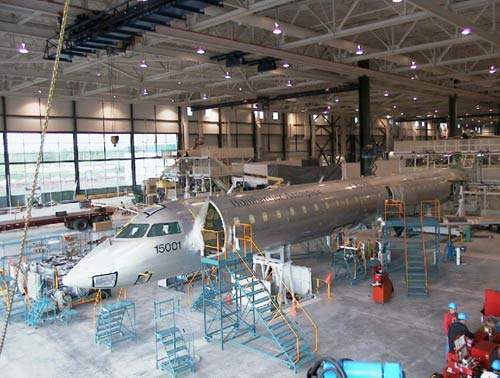 Assembly of the first production aircraft began in 2001. 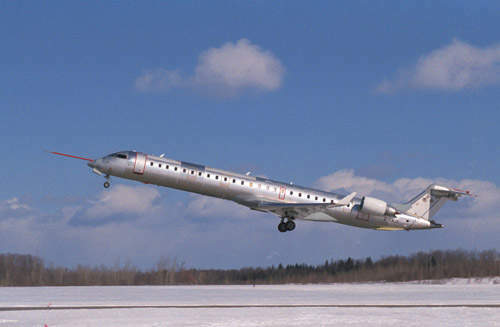 The aircraft completed its first flight on 21 February 2001 at Montreal’s Mirabel International Airport. In February 2003, the first aircraft was delivered to launch customer, Mesa Airlines, which has placed firm orders for 25 aircraft. Total orders for the CRJ900 regional jet are 343 aircraft of which, 287 have been delivered by March 2014. 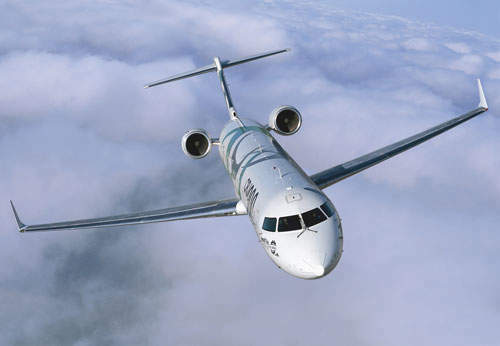 The regional aircraft division of Bombardier Aerospace, based in Toronto, Ontario, is responsible for marketing, sales, contracts and product support of the CRJ Series jet airliners. The aircraft has extensive commonality with other members of the CRJ family: the CRJ900 has common crew qualification (CCQ) with the CRJ200 and CRJ700, as well as a reconfigurable flight simulator, common maintenance and training procedures, spares and ground support equipment. In May 2005, Bombardier launched the Challenger 890, a corporate shuttle based on the CRJ900. The Challenger 890 accommodates 90 passengers in standard cabin, 52 in split cabin and 52 in deluxe cabin configuration. The aircraft entered service in February 2008, with Suncor Energy Inc of Calgary, Canada. In May 2007, Bombardier announced the CRJ NextGen family aircraft, which have new cabin interiors, including larger passenger windows, more baggage space and LED lighting. American Airlines is the first customer to benefit from the latest CRJ900 NextGen regional jet as it reduces the 5.5 percent fuel burn reduction compared to the CRJ900 aircraft. The first CRJ900 NextGen aircraft for American Airlines was unveiled in May 2014. 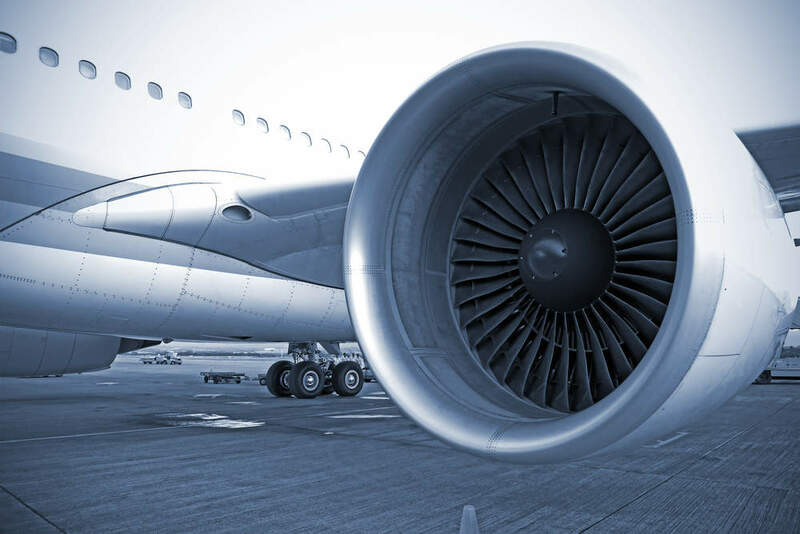 There is also increased use of resin transfer moulding (RTM) composites in the aircraft construction with reduced fuel consumption. The first NextGen aircraft, the 75 to 90-seat CRJ900 NextGen, entered service with Northwest Airlines in June 2007. It is the bestseller among the CRJ NextGen series and has over 120 orders. The 66 to 68-seat CRJ700 NextGen entered service in 2009. As of March 2014, the total deliveries, orders and options for the CRJ family were over 1,817 CRJ aircraft including 343 CRJ900 and CRJ900 NextGen aircraft. In July 2010, Duetsche Lufthansa of Germany placed an approximately $317m worth order for eight CRJ900 NextGen aircraft. 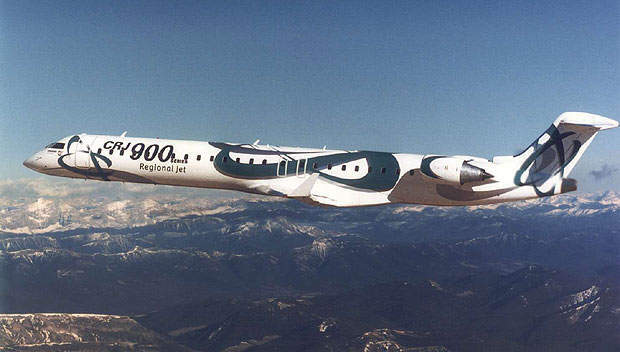 China Express Airlines confirmed a conditional order with Bombardier for six CRJ900 NextGen aircraft in February 2012. The order was finalised in July 2012. Bombardier Aerospace received a firm order from Rwandair for two CRJ900 NextGen aircraft in March 2012. The first of two aircraft was handed over in October 2012. In June 2014, Bombardier Aerospace received an approximately $727m worth firm order from an unknown customer for 16 CRJ900 NextGen aircraft. The order also includes options for eight additional aircraft. The CRJ900 has a range of 2,956km. Bombardier has also introduced a long-range version, CRJ900LR, which will have a range with a full passenger load of 3,385km, taking off from a 1,944m runway. 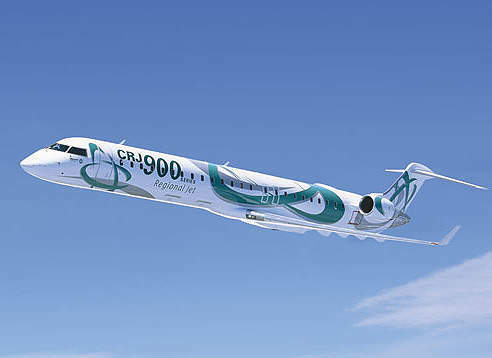 The CRJ900ER European has been designed for services to European airports. The aircraft has a reduced maximum take-off weight (36,995kg as compared to 37,421kg for the CRJ900ER) to minimise the weight-sensitive charges at European airports. The two-pilot flight deck is fitted with a Rockwell Collins Pro Line 4 six-tube Electronic Flight and Information System (EFIS) and an Engine Indication and Crew Alerting System (EICAS). The instrument panel has six 127mm×178mm (5in×7in) cathode ray tube displays. The aircraft is equipped with a Flight Dynamics HGS 2000 head up display and guidance system, a Rockwell Collins automatic heading reference system (AHRS), terrain collision avoidance system (TCAS) and a Rockwell Collins digital weather radar. The integrated avionics processor integrates the autopilot and flight management systems. The fuselage is of semi-monocoque design. The main cabin, by C&D Interiors, is nearly 21.6m in length with a centre-line width of 2.13m and the capability to seat up to 90 passengers. Standard seating is for 86 passengers with seats at 31in pitch (78.7cm) in a four-abreast configuration. Other interior layouts include two-class interiors with mixed seat pitch. The aircraft’s lighting is supplied by Hella Aerospace GmbH. The rear baggage compartment and underfloor baggage compartment provide a total baggage space of 25.17m³. The cabins are air-conditioned by a Liebherr air management system. GKN manufacture the tailcone and doors. The aircraft is powered by two General Electric CF34-8C5 turbofan engines fitted with full authority digital engine control (FADEC). They provide 58.4kN thrust at take-off. The engine nacelles, supplied by Bombardier Aerospace (Shorts Brothers) of Belfast, are mounted on the sides of the rear section of the fuselage. There are two integral wing fuel tanks with a fuel capacity of 11,148l. The Intertechnique fuel management system is fitted with Ratier-Figeac controls. The maximum usable fuel load is 8,823kg. A Honeywell auxiliary power unit is installed in the tailcone. Electrical power is provided by a Hamilton Standard electrical generator with two integrated drive generators providing 40kVA. The aircraft is fitted with Menasco Aerospace retractable tricycle-type landing gear. The CRJ900 landing gear is strengthened and is fitted with upgraded wheels and brakes compared with the CRJ700 in order to be compatible with the higher operating weights.